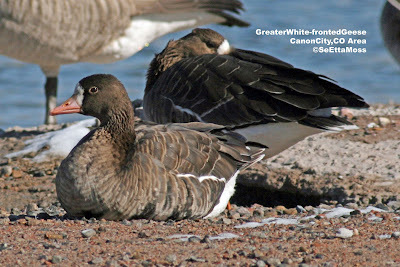 Greater White-fronted Geese that winter in and around Colorado breed in far north Arctic areas. 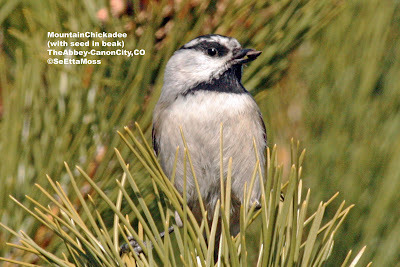 Every year a small flock spends the winter in the Canon City area. This flock is composed of 11 birds, including 2 juveniles. It is reported in Birds of North America online that families remain cohesive during the winter and that this species maintains family bonds "over number of years and persist longer than in other geese." So it seems likely that the Canon flock is related. 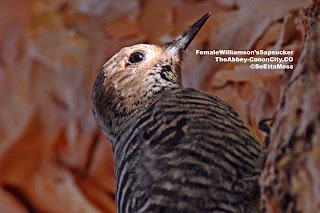 Just as I was concerned that I hadn't found any Williamson's Sapsuckers yet, I found this female at the Abbey. As I noted below, one or more Williamson's Sapsuckers has wintered in Canon City since I discovered the first one in 2003. I think this is an adult female but she was busy drilling holes and didn't give me a good view of her breast area which is black on adults. 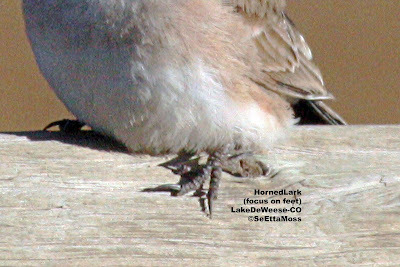 Immature females should have more brownish feathers on their upperparts also. 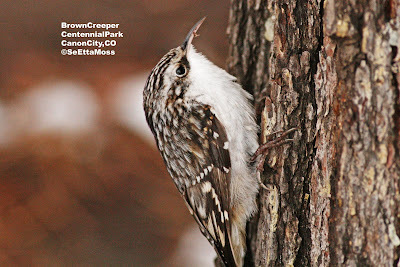 I found this male Yellow-bellied Sapsucker in Centennial Park in Canon City last week. It was an exceptionally shy sapsucker which made it most challenging to get these pics as it reacted to the mechanical clicking of my digital DSLR camera (I turned off the bells when I first got the camera but it has distinct clicking noises when I shoot pics that bothers some birds). 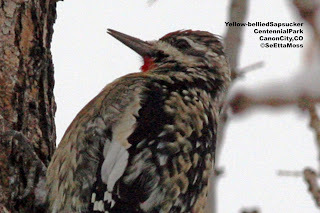 This appears to be a different bird than the male sapsucker I found on Oct 29 (see post on Oct 29, 2009) as that bird had extensive bright red on it's crown as well as it's chin and throat while this bird has somewhat limited red on it's crown, a red throat but some white on it's chin. The second pic from the top shows the extensive white barring, much with a buffish tinge, that is distinctive of Yellow-bellied Sapsuckers. 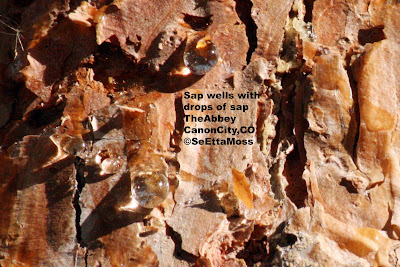 The Wet Mountain Valley where Westcliffe and Lake DeWeese are located provides many opportunities to see hawks. 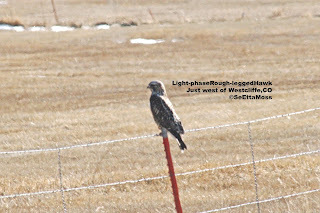 In winter, there are usually several Rough-legged Hawks though I only found one yesterday and I got the distant pic of it shown at the top (it was well over a hundred feet away). However I did see 8 Red-tailed Hawks during the half day I birded that area. The scenic mountains such as these in the Sangre de Christo range provide a great backdrop to birding in this area.